ChatBot to answer anything about Ube-city's homepage and its open data automatically. 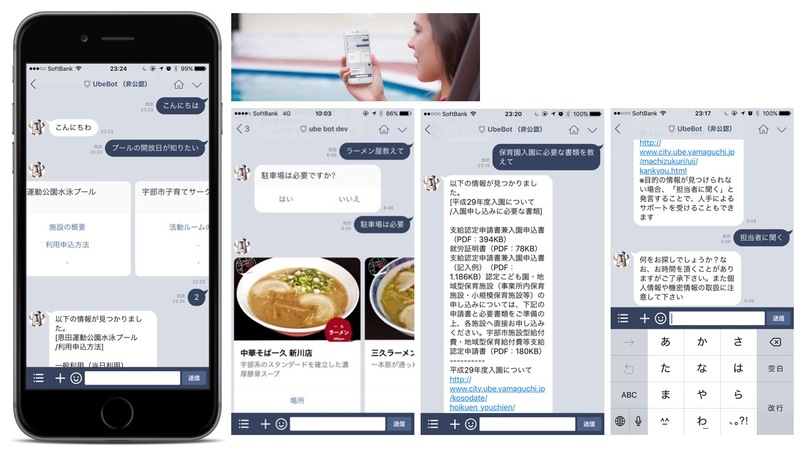 Bot is running on messaging platform LINE in Japan. Details is here. The mobile pill case connected by 3G to watch out for an usage history of medicines by others such as children of the elderly or doctors. It prevents forgetting to take medicines through communication with a care person. The demonstration of this prototype won the prize. 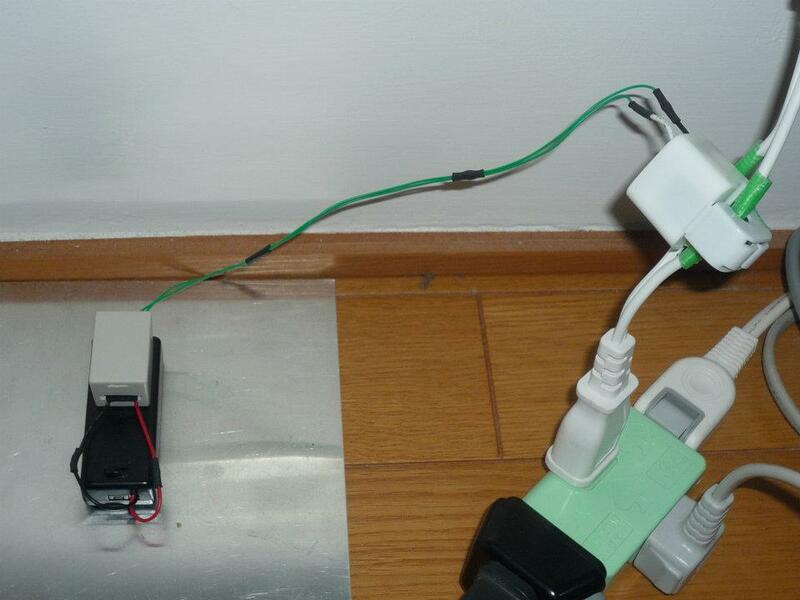 I built the system to control several appliances such as light, air conditioner and so on by voice. It's very useful for me to take childcare situation like that my hand is dirty. Of course I can remote control them from outside to warm and humidify our room in advance. In addition, I can take a note the count of son's diaper changes or milks by voice quickly. I add useful functions day by day. 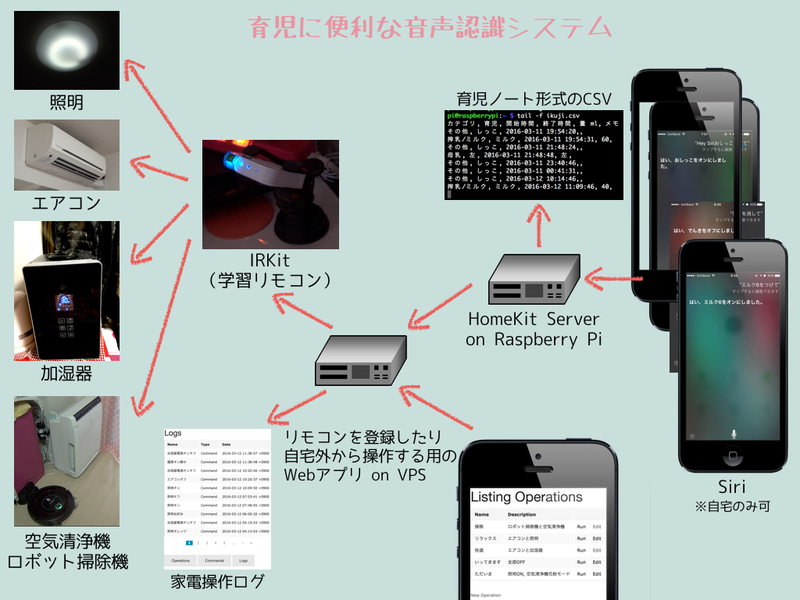 This application was made to enter the Tokyo Metro Open Data Contest and won the prize. It enable to find toilets on your train route easily and share the congestion of them. I prepared the robot for our wedding party instead of ordinary welcome wedding sign. He kept writing the date of party and hart mark at reception. It's inspired by Plotclock. The system to check our office toilet remotely without the need to go to a restroom. It enables us to focus attention only on our work. We're verifing practical effectiveness of this system at our small office. Motion and CDS sensors are connected Spark Core device. 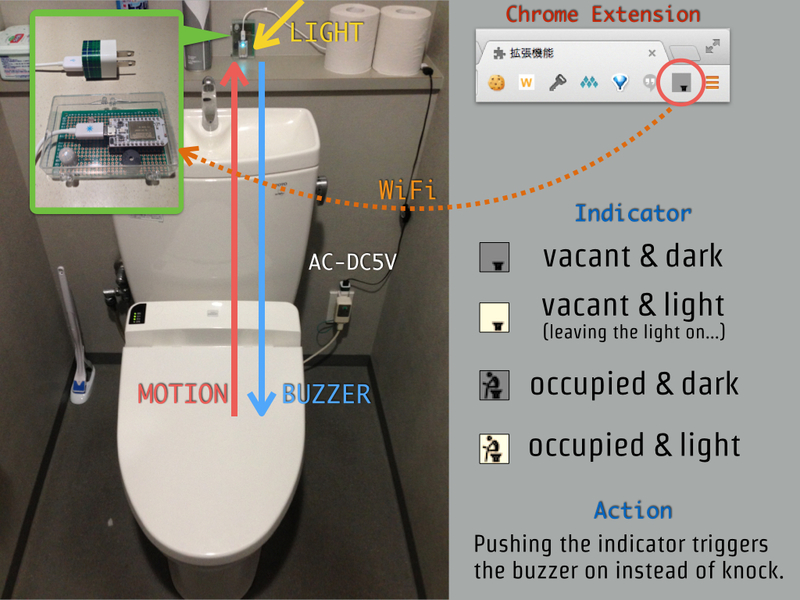 And the measurements are sent to users chrome extension via WiFi. When there is long-stay occupier, you could sound the buzzer attached this system. Detail is here. The iOS application for me to memorize the words in Karuta. It enables to show also a play on words in addition to set of Karuta words. I embedded heart rate sensor in FRISK case. Heart rate is indicated by the blinking LED at caps lock key. It's introduced in my presentaion at Tokyo Ruby Kaigi 10. 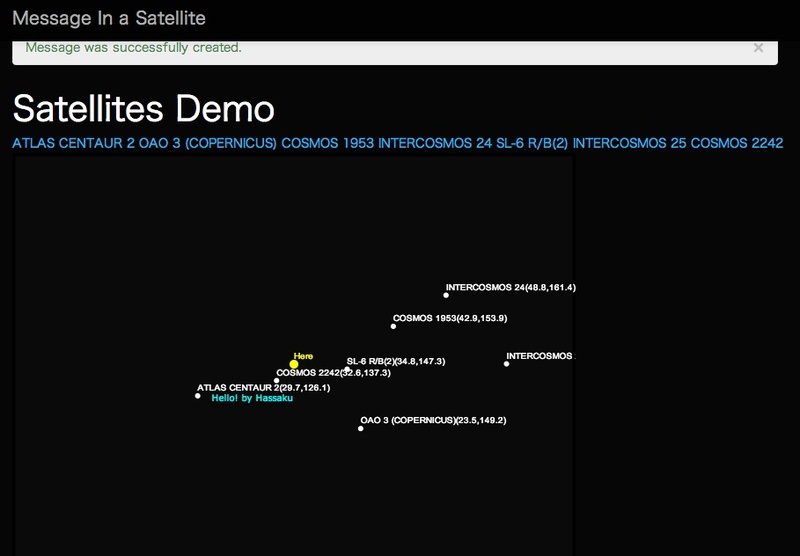 Message In A Sattellite web application enables you to make a message in a satellite flying abobe your head. The message might be opened someone in another place. Your browser have to support Geolocation API. Crap is visualizer for excited audience. Using web browser, it shows audio spectrogram and enables to capture most excited moments in real-time. 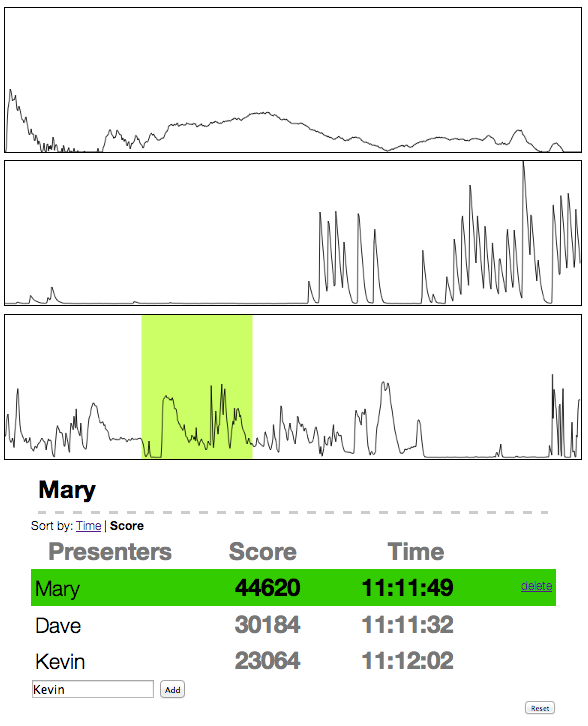 Then the captured results used for rakning in an event such as lightning talks. The small web application to take minutes of meeting using Meteor framework. Anyone could select someone's and put one's remarks on record in realtime like Google Docs. This demo web application is made to apply becoming Leap Motion developper. I appealeld a potential of fun to play Jenga online using Leap Motion. Prototype iOS native application made for the Space Apps Challenges. It downloads a current image from NASA website and changes lock screen at intervals. I made the small toy robot using FRISK case. He moves by two vibration motors in response to light. This is the first iOS application which I released. It is idea processor tool like mind map. This presentaion tool enables anyone to access an arbitrary page and to add comments on the page. The comments are viewed by others at the same time. HTML5 Canvas and WebSocket are used. Questionnaire application to create quesitions and to vote the options online. It enables to push them in realtime using GAE ChannelAPI. 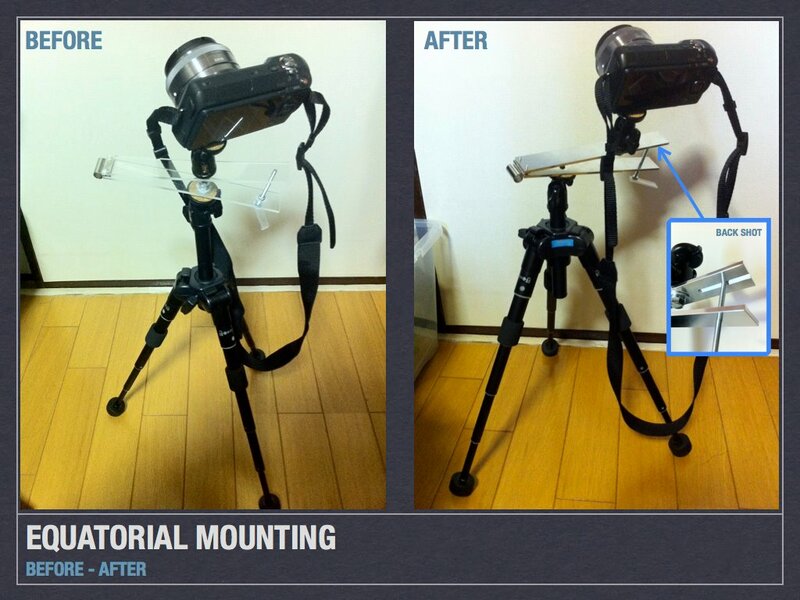 This is the manual tracking equatorial mount to take starry sky photos. I designed it to track stars by turning screw in a clockwise rotation with the second hand of a clock. 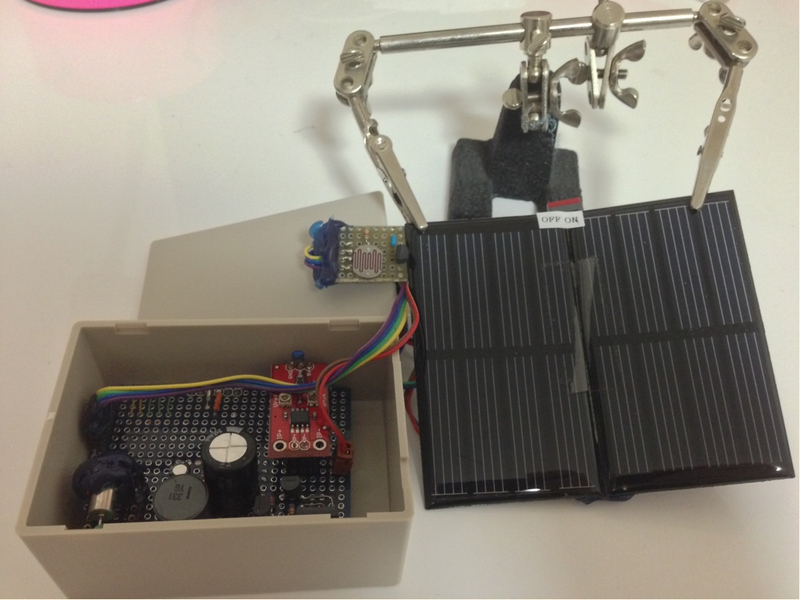 Maximum Power Point Tracking(MPPT) is a technique that charge controllers use for PV solar systems to employ and maximize power output. This system has an illuminance sensor and a thermometer. The maximum power point is calculated by illuminance, temperature and actual power output. Arduino is used for processing and logging (not shown in the picture). I made very compact device for logging household power usage. It has non-contact current sensor, two AAA batteries and micro SD card writer to store power usage a minute. This is the autonomous robot run in the Tsukuba Challenge competition which is famous as real world robot challenge in Japan. 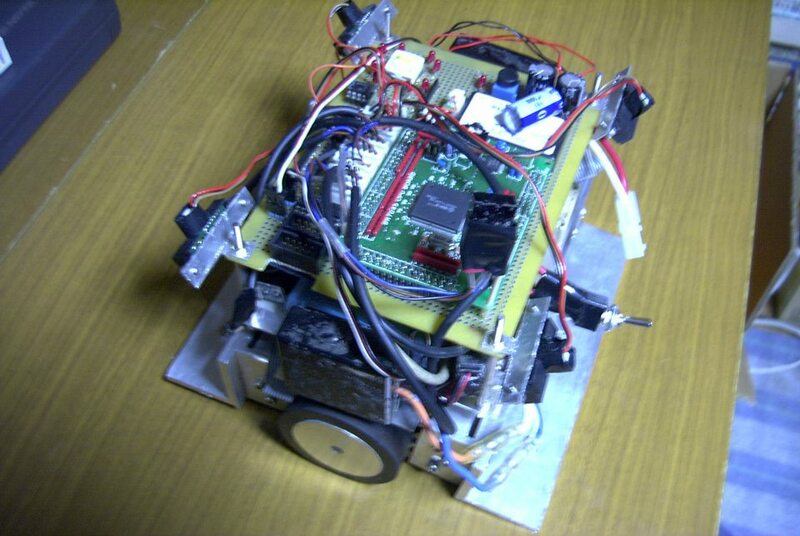 I devised ways of keeping everything compact effectively as to bring whithin my carry case and could set up the robot easily. This is an interactive toy made as a coursework assignment. 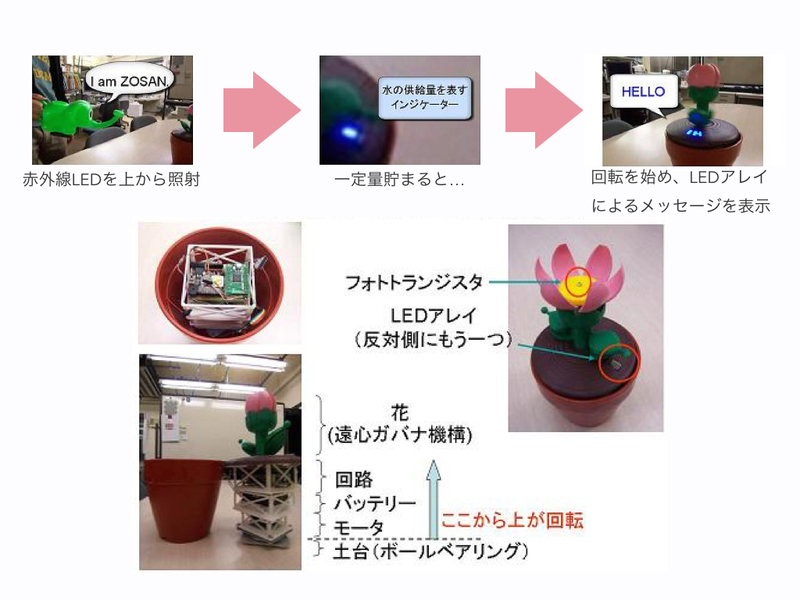 When you expose the top of flower made by 3D printer to infrared light, the flower starts spinning and opening petals, then some messages are shown by LED array. This is the next version of Micro-Clipper Robot. The feature is to grasp, turn and put a can without stoping. It took the Namco award. 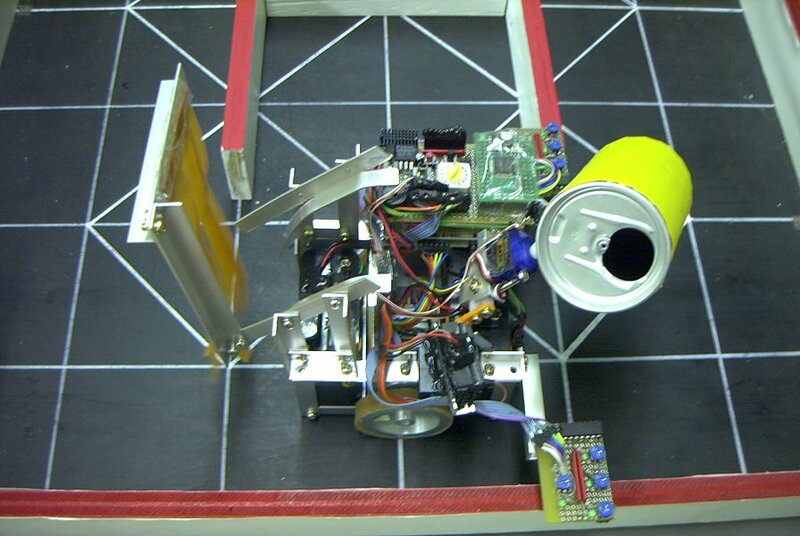 This autonomous Micro-Clipper robot has grasping and turning a can upside down mechanisms. The feature is to enable sensing farther walls and planing in an efficient way. It took the technology award. 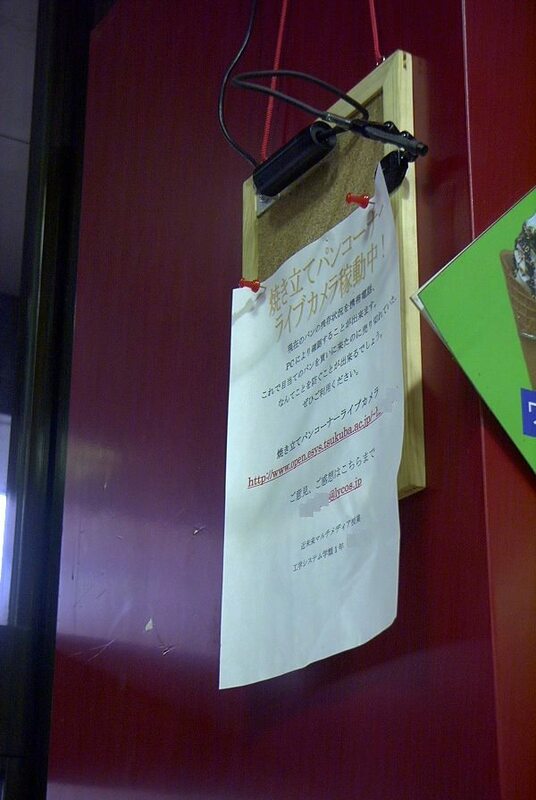 The networed live camera system at bakery in university. Anyone could check fresh breads anytime online. The feature of the system is to notify breads replacing via image analysis. This is the first robot I have made ever! Robot-Sumo is a kind of battle game using robot which is popular in Japan. The feature of the robot is to have contrast scrapers between front and back. Copyright(C) 2014-2015 hassaku All Rights Reserverd.